← Zhenya Gala Videos Collection-2004-2009 & Happy Lantern Festival! On March 2, 2010 internet site http://sib21vek.ru/ will start voting for the title “The Siberian of the Year”. There are 28 candidates chosen by the Experts’ Committee and only seven of them are going to get a very honorable title of “The Siberian of the Year”. The main goal of this project is to present these wonderful and respectable people to the general public. This project is non-commercial and based upon free-will of Experts’ Committee and organizers. 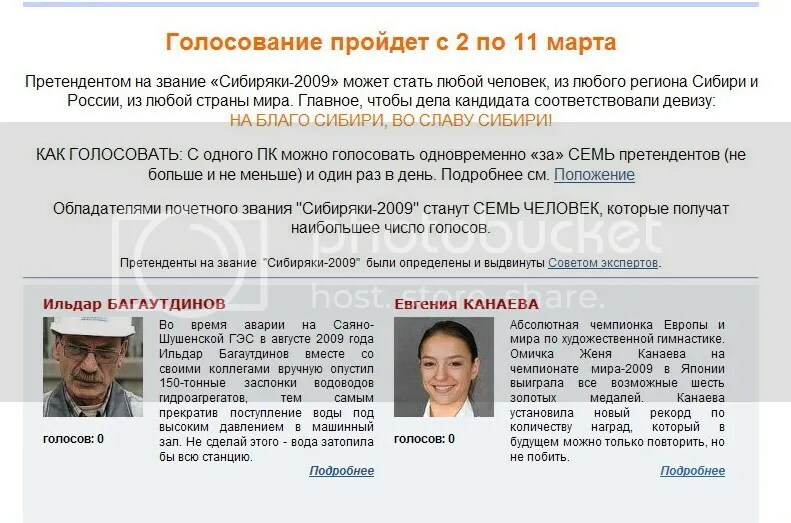 Evgenia Kanaeva was one of the winners of this project in 2008 (note by Zoe Wan: Zhenya was 1st in the vote of 2008) as a person who won gold medal at the Olympic Games. This year she is nominated again as a gymnast who won 6 medals at the World Championship in Mie thus making an “eternal” record which can be repeated but not surpassed. The voting will go on within March 2 – March 11. Everyone can vote for seven different people once a day. Note by Zoe Wan: Irina Tchachina also won “The Siberian of the Year” before, she was the winner of 2005. The voting is finished. Evgenia is with the second most votes one of the seven "Siberians of the year 2009". Congratulations Zhenya! @Michel:For football, I only watch World Cup 🙂 and I love Schumi too, but I am not a fan of F1 at all, just thought Schumi is a great athlete. @Michel:OK, anyway we still love Zhenya and I think she will be the one of 7 winners.Again, RG lost to football (soccer). I read that the leader is a coach of a football club. Do you love football? if so, who and which team is your favorite? I am not a big fan, my favorite player is Zinedine Zidane. Ahhhhh…. Evgenia is now only the second. @Michel:Thank you ^-^ seems the vote increasing very fast today! now Zhenya\’s vote has exceeded 2200! YES! Hopefully Zhenya can win again! everyone can vote, not just for Russian. Vote for Zhenya!這個票選每個人都能投, 不是只有俄羅斯人可以投, 希望Zhenya可以連莊! She will win I\’m sure!! !GO ZHENYA!!!!! !